Decorative Life: Generally only looks good under many commonly encountered interior conditions for 1 to 2 weeks. Removal of some new and expanding leaves can increase flowering. A member of the Nyctaginaceae (four-o’clock family). The only somewhat common relatives are four-o’clock and sand-verbena. Flowers are inconspicuous, each one surrounded by three colorful rounded bracts. Hence, it is grown for the beauty of the bracts. Stems climbing, woody, sometimes spiny. Most commonly grown as vines. 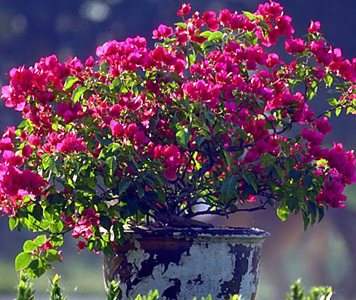 ‘Sanderiana’ is one cultivar suitable for potted plants. The specific epithet name “glabra” means smooth, no hair. The genus was named after de Bougainville, 1729-1811, French navigator. Originally spelled Buginvillea. The many forms of this plant make absolute species identification difficult at best. Will generally do well in light levels at least bright enough to read a newspaper in comfort but more light would be better. Flowers very sensitive to climate changes suggesting that newly purchased plants may loose some flowers when placed in an interior environment. Using ‘Purple Flower’ and ‘Taipei Red’, Chang and Chen (2001) reported that STS was totally ineffective in preventing bract fall regardless of when it was applied and regardless of the flower (bract) maturity. However, the STS became effective in preventing bract fall only when NAA was also applied. NAA (1-naphthaleneacetic acid) is normally used as a rooting hormone in the floral and nursery industries. On the other hand, Cameron et al. (1981) reported that STS was effective in preventing bract drop, cultivar not reported.